Can you guess why I decided I needed to make this recipe? It was love at first sight. It’s sooo pretty and it made my house smell like heaven as it was baking. I won’t lie, this recipe is a little involved. It is really, truly from scratch (well, besides picking your own hazelnuts to make the nutella, but I bet someone has a recipe for that too!). As a reformed perfectionist, undertaking this recipe was both exciting and nerve wrecking. I wanted it to come out just like the picture, and of course that is almost impossible. So if you decide to go for it, embrace the messiness and know that it is bread stuffed with nutella and that it will taste delicious no matter what. And if it goes really wrong, promise me you will post it on pinterestfail.com (and yes, if you haven’t gone on this site, you need to go right now). In a small bowl, dissolve yeast in ¼ cup of the water. Let sit for 10 minutes to activate. Meanwhile, combine flour, salt, and sugar in the bowl of a stand mixer. After add yeast and the remaining water, mix on low with a dough hook attachment. Turn speed up to medium, and knead dough for about 7 minutes. Place dough in a lightly oiled bowl. Cover bowl loosely with plastic wrap, and then set in a warm place. The dough is ready when doubled in size – about an hour. On a lightly floured surface, roll dough to form a rectangle, roughly 12 x 15”. 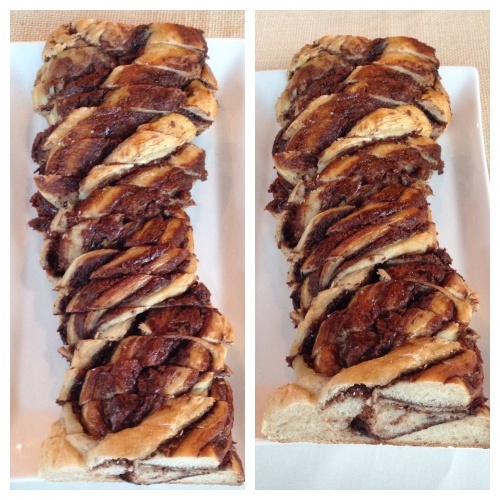 Spread Nutella in an even layer on the surface, leaving a ½ inch border of dough. (I found it helpful to heat the Nutella in a microwave-safe bowl for about 30 seconds. This makes spreading it much easier.) Roll tightly and place on a parchment-lined baking sheet. Cut the dough down the middle with a knife, leaving one end intact. Twist ends overtop each other, making sure to turn cut side toward the top. Cover dough loosely with plastic wrap and let sit 20 minutes. Preheat oven to 350°F. Brush surface of the bread with the egg wash. Bake bread for 20 minutes. Raise temperature to 425°F and bake until lightly browned on top, about 5-7 minutes more, keeping a close eye on it to make sure it doesn’t over brown. Remove from oven and let cool before serving.